Posted September 26, 2012, 8:00 a.m. In the race to represent one of Virginia’s seats in the United States Senate, former Senator George Allen (R-VA) faces off against former Governor Tim Kaine (D-VA). Incumbent one-term Senator Jim Webb (D-VA) has decided to retire and is not seeking reelection. Each of the fifty states have two seats in the Senate, for a total of one hundred seats. 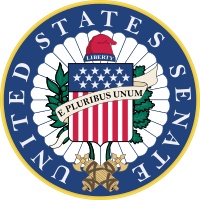 Senators serve six-year terms, and elections are held on a staggered two-year schedule. This year, thirty-three seats are up for election. The Democratic Party currently holds a 51-47 majority over the Republican Party in the Senate. Two seats are held by independents who generally caucus and vote with the Democrats. Currently, both of Virginia’s seats in the Senate are held by Democrats. Allen was a reasonably accomplished governor in the Commonwealth. In the early 1990s, Virginia, like much of the U.S., was experiencing a serious increase in crime rates. Allen was elected in large part because he promised to be tougher on crime than his opponent, Attorney General Mary Sue Terry (D-VA). After the election, Allen spearheaded efforts to reform the state’s welfare programs and put in-place criminal justice reforms—establishing ‘truth-in-sentencing’ guidelines and eliminating parole. Allen was also involved in the establishment of the ‘Standards of Learning’ standardized testing system in Virginia’s schools, which was reasonably effective—at least before major ‘reforms’ under Allen’s successor, Governor Jim Gilmore (R-VA). Allen also worked hard to protect Virginia schools from onerous federal regulation. Perhaps Allen’s most notable accomplishment as governor was that he was able to work successfully with the General Assembly to implement major policy initiatives like the truth-in-sentencing reforms, even though both the House of Delegates and Virginia Senate had solid Democratic Party majorities at the time. However, Allen was ineffective at convincing the legislature to rein-in spending. Allen did argue for tax cuts, but the General Assembly refused to comply and instead increased the state budget by over forty-five percent during Allen’s four-year term. During his term in the United States Senate, Allen introduced or authored bills to amend the U.S. Constitution to require a balanced budget, allow the president to veto particular line-items in bills, withhold Congressional pay until Congress passes a budget before the beginning of a fiscal year, allow people to use their 401(k) investments for long term care insurance, and prohibit many forms of Internet taxation. This is all well and good. But Allen consistently voted during his tenure in the Senate for the big-government, big-spending policies of President George W. Bush (R), and he has criticized the automatic federal budget cuts that are looming on the horizon even though they are the best hope for reining-in federal spending. Allen spent his time in the Senate introducing some really great, fiscally conservative bills . . . and yet, at the same time, never seems to have hesitated voting for each massive budget that came across his desk from Bush and the Republican Party leadership. Allen, like many of his Republican brethren this year, seems to have rediscovered fiscal conservatism. His campaign advocates for a simpler, fairer tax system, a balanced budget amendment, and generally rational fiscal policy. He supports an energy policy that makes use of our natural resources here at home, including coal. He supports business-friendly laws like ‘right-to-work’ and minimizing unnecessary regulation, policies that have worked well for Virginia and will work well across the rest of the county too. Curiously, Allen has been consistently inconsistent on human rights issues. He has been pretty solid in his support for the right to life, property rights, religious freedom, and federalism. He has, however, been a tepid and inconsistent supporter of Second Amendment liberties, at various times supporting and opposing counterproductive gun control regulations, and he co-sponsored a proposed constitutional amendment to ban burning the American flag—a clear violation of free speech rights. Kaine went on to become the Chairman of the Democratic National Committee in 2009, while he was still governor, and remained in that role until 2011. There, he presided over the party’s difficult 2010 congressional midterm elections, which saw a record-setting loss of sixty-three seats (and the party majority) in the U.S. House of Representatives and six seats in the U.S. Senate. Kaine was an effective and accomplished mayor in Richmond. During his tenure, the city embarked on building its first new schools in decades and significantly reduced the city’s crime rate, all while lowering taxes. Rather than embarking on misguided and unconstitutional gun control schemes, Kaine instead spearheaded an initiative called ‘Project Exile’ that improved enforcement and prosecution of existing gun laws. During his time as mayor, the city was recognized by President Bill Clinton (D) and President George W. Bush (R) for its anti-crime efforts, and the city was—for the first time—rated by Forbes Magazine as one of the ten best places in America to do business. His record as governor, however, was quite different. Kaine’s tenure was marked by a constant butting of heads between him and the Republican-controlled General Assembly, and little progress was made in the key areas of transportation and education policy. Kaine was successful at improving the Commonwealth’s conservation efforts, the digitization of Civil War records held by the state, and supporting the Virginia coal industry. But he also supported the Metropolitan Washington Airports Authority’s (MWAA) misguided plan to build the Washington Metro ‘Silver Line’ above ground through Tyson’s Corner, and Virginia’s idiotic plan to build ‘High Occupancy Toll’ (HOT) lanes on the Washington Beltway (which is also supported by incumbent Governor Bob McDonnell [R-VA]). During Kaine’s tenure our state’s budget kept growing and growing, even though we were faced with the same economic downturn as the rest of the country. When he left office, his successor was faced with a whopping $2.2 billion shortfall. In this campaign, Kaine calls for keeping business taxes low and minimizing regulation, investing in transportation infrastructure, and fiscally responsible governance. He calls for broad, targeted cuts to the federal budget, but rejects across-the-board cuts off-hand even though they are the most likely to actually work with less bickering between the parties (since everybody gets ‘punished’ equally). He calls for a simplified tax code, but endorses tax increases on the ‘rich’ even though tax increases are incredibly dangerous in a recession, and the ‘rich’ already pay more than their fair share (on average) anyway. He claims he wants to protect Medicaid, Medicare, and Social Security, yet takes many of the best reform ideas off the table. Lastly, Kaine claims to be a strong supporter of civil liberties, yet his actual record on the topic is decidedly mixed. In typical form for a Virginia Democrat, he is reasonably strong on matters of equality and somewhat less hostile to our Second Amendment rights than many of his party brethren. He also broke with the Obama administration over its First Amendment religious liberty violations, for which he should be applauded. But he is also a strong supporter of the misguided health care reform plan colloquially known as ‘ObamaCare,’ despite its chilling Tenth Amendment implications. He opposed the U.S. Supreme Court ruling that restored First Amendment rights during elections (Citizens United), and takes a morally inconsistent view on right to life issues—claiming that he personally opposes abortion (and believes it to be murder) but does not support outlawing it. This is nonsense. The first responsibility of a just government is to protect the God-given liberties of its citizens, and the first and most fundamental of all liberties is the right to live. Without that, there are no other liberties. Virginians should consider three key issues in their vote for U.S. Senate. First, our chosen candidate must work to rein-in federal spending, balance the budget, and begin reducing the national debt. Second, he must work to undo attacks on our civil liberties, which have greatly accelerated under the current administration. Third, he must exercise his ‘advise and consent’ role in judicial nominations to ensure that justices—especially those nominated to the U.S. Supreme Court—will rule in accordance with the plain text of the U.S. Constitution. The court is precariously balanced, with too many justices consistently voting against our basic civil liberties. The Senate must police judicial nominations more closely and try to ensure that new justices are capable of reading, comprehending, and applying the Bill of Rights. Neither of the candidates excel in these three areas. Allen has a bipolar record on fiscal conservatism, supporting balanced budgets but voting for massive deficits over and over under President George W. Bush (R). Kaine, on the other hand, also speaks about balancing the budget but left his successor in the state house with a $2.2 billion shortfall. Allen has a mixed record on Second Amendment rights and free speech, but is reasonably strong on the right to life, property rights, and federalism. Kaine is strong on the First Amendment, but doesn’t seem aware of the 10th’s existence or of government’s essential role in protecting human life. Allen says he’ll only vote to confirm court justices who understand the nature of their job, which is all well and good until you consider that he voted to confirm Chief Justice John Roberts, who recently voted to repeal all Tenth Amendment limits on federal authority so long as we pretend everything is a tax. Kaine, however, characterized the Supreme Court’s ‘Citizens United’ decision, which restored our First Amendment rights during elections, as ‘misguided.’ He also supported the court’s aforementioned ruling that effectively repealed the Tenth Amendment. In the end, having considered all of this, I endorse the election of George Allen to Virginia’s seat in the U.S. Senate. This endorsement is not without reservations. Allen must consistently oppose large federal deficits, even when a Republican is in the White House. He must improve his support for Second Amendment rights, and oppose any misguided efforts to limit our First Amendment rights—even the right to burn the American flag. And, as we recently learned from Chief Justice Roberts, conservatives must be more cautious about who they nominate and confirm to the U.S. Supreme Court. But even with Allen’s obvious weaknesses, it is clear that Kaine would be a worse choice. He is even weaker than Allen on fiscal responsibility, untrustworthy on civil liberties, and inclined to support a Supreme Court that embraces a nebulous, ‘living document’ read of the U.S. Constitution under which none of our rights are safe.